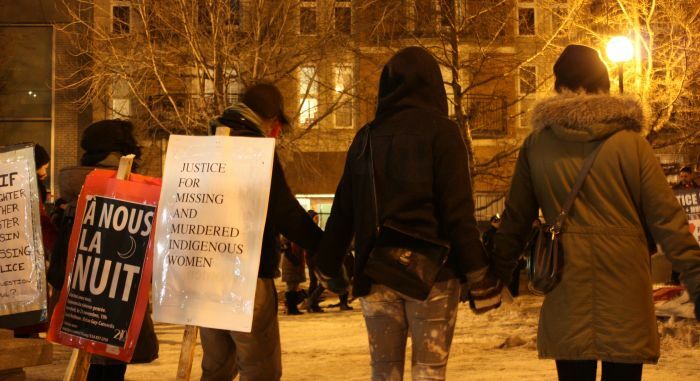 On Februray 14th 2013 over 700 people gathered at St. Laurent Metro to spend their Valentine's day at the Memorial March for Missing and Murdered Indigenous Women. The first ever memorial march took place in 1991 after a Coast Salish woman was murdered in Vancouver. The annual march established on the premise of expressing compassion, community and caring for all women in Vancouver's downtown Eastside, Unceded Coast Salish Territories. Various prominent speakers took the stage at this year's march to stand in solidarity and honour these missing and murdered women. This is a presentation by Gladys Radek, a Gitxsan/Wet’suwet’en First Nations woman from Morcetown who is a human rights activist.